There is never a dull moment at the MaRS Centre and that includes our rooftops! In July 2012, beehives were installed on the east roof of 101 College Street, four storeys above ground level. These hives host two independent colonies with approximately 50,000 honeybees each in the summer months and roughly 20,000 bees in the winter months. We want to bring awareness to the vital role honeybees play in food sustainability and ecosystems. The rapid decline in honeybee populations around the world may seriously impact our agriculture industry, environment and food security. Read our bee blogs to learn more. At MaRS, we are always looking for opportunities to engage with partners in our community. Through this project, we have connected with many local beekeepers and community workers who are making Toronto a better place to live and work. Hives help diversify and strengthen the plant life around the MaRS Centre and surrounding area. With a forage radius of four to five kilometres, our bees are helping pollinate plants in our city. 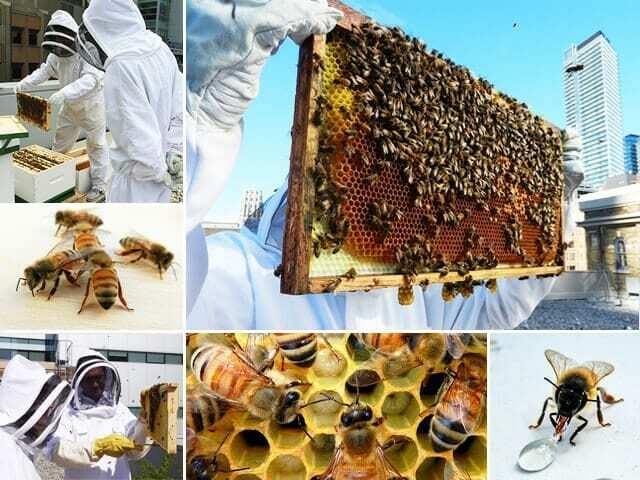 Free bee tours allow employees to get up close and personal with our hives. We provide beekeeping suits and gloves to ensure a safe, fun experience for those interested in urban beekeeping and the MaRS bees. The Bee Project is funded through private donations and community fundraisers, and maintained by a team of employees. For more information, connect with us at beecommittee@marsdd.com. See the bees in action on our Flickr albums and Pinterest board.